Well you know by now I’m a Xbox Live Ambassador. I’ve blogged about the new Xbox Live Features, a move night with Love Film and our TV night with Vampires and Gleeks. This week were trying out Sky Sports. Don’t forget if you got an Xbox from Santa there is an Xbox Live Gold Membership, there is a discount below. On Monday my oldest Lucas went to his first football match with his dad and his grandad, this was to see Glasgow Rangers at Ibrox stadium, where they were playing Motherwell. Now he only turned 5 on Christmas eve, but he loved every minute of it and so did his dad and grandad. Three generations at the stadium for the team they have supported all their days. My husband and his dad used to be season ticket holders but had to give up their seats two seasons ago when my father in law had to get heart surgery. He was seventy last year and this was his first game back. And what a game to go back to. The mighty Gers won 3 and a nill as my son told me. My dad was also a Glasgow Rangers fan and I had a little tear in my eye when they were leaving as I knew this would have been a proud moment for him also, it is such a shame he died before my boys were born. Lucas got to see the mascot and he got his first football scarf. He was so proud and it hasn’t left his side since. 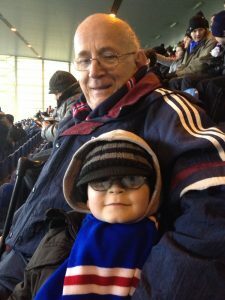 Here it is on Lucas with his Grandad. He looks all nice and cozy there. Certainly different from playing the game. Later on in the week, my two boys and the bigger boy (hubby) settled down on the couch to watch a footie match on the Xbox Live via the Sky Sports. I got a little bored watching as footie isn’t really my thing, I don’t mind it but I have a short attention spam when it comes to having to watch 90 minutes, so I thought I’d take a little video. You see the scarf made another appearance, it really hasn’t left his side. I’ve had to insist he doesnt’ take it to bed. I think we have a little football star in the making, what do you think? He trains to play football and has done since he was 18 months old. He know plays with a wee team which my husband helps coach. Some father son bonding there too. Failing that, he’s always got his nose to pick. I can safely say these three boys loved the sports features on Xbox Live. It streamed well, there were no blips or pauses. It was easy to get into, especially with the voice control and the team ever scored and went on to win. All in all a win win situation for the boys and Xbox Live. I have a very special off for my wonderful readers, if you go to our page on the Xbox site you will find an option to get 3 months Xbox Live Gold for half price. All you have to do is enter my special code which is Ss3nKM8nn. Let me know if you have any problems with this, I am sure you won’t. Now go enjoy all the wonderful new features of Xbox Live. Started School, How is it Going?